You are here: Home / Blog / Wine with Winston / A Perfect Wine Glass? Boy, oh boy- I have missed this keyboard. Before I talk to you about the importance of using a wine glass when drinking wine, I wanted to catch you up on my last month. Several weeks ago, I had a sore toe. I licked it until it felt better, but all of a sudden my toenail popped off! Mom and Dad took me to the vet, and it turned out that I had an infection in my bone. We decided to amputate the first bone of that toe, and I have been easing back into winery life ever since. Luckily for me, the now absent toe has done nothing to distract from my classic good looks, and Mom has even gotten me a black glitter wrap for my foot that perfectly matches my dazzling personality. The only thing my foot has slowed me down with is the “on the ground research” needed for this blog. While I was laying around waiting to join all of you back in the tasting room (and here online) I was able to read several fascinating stories about wine on the news. My favorite story was one about a woman riding around a parking lot drinking wine out of a Pringles can. Is she a genius or what? 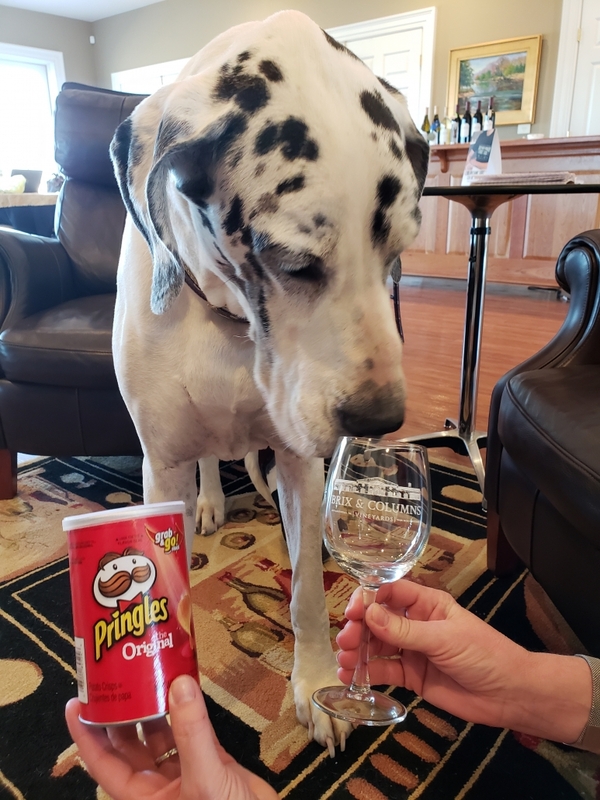 Pringles are delicious, wine is delicious; it must be a match made in heaven. 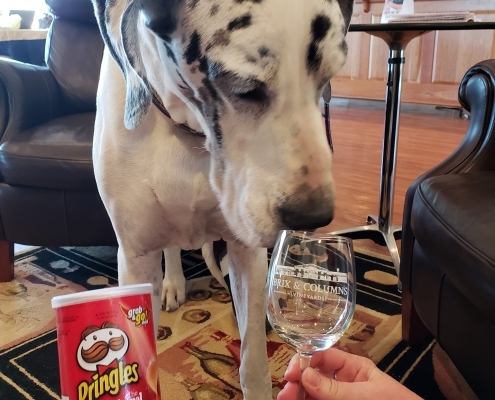 I quickly decided that I would pull together a plan for Mom and Dad to convince them that we should be using the cans in the tasting room in place of the wine glasses we currently use. Good thing I did some research. It turns out that the wine glass is actually a pretty important element in the enjoyment factor of drinking wine. Now, wine glasses come in all sizes, but the basic shape of all of them is similar. : the glass is wider in the middle and narrower at the top. This shape is for a very important reason. First, the widest part of the wine glass usually tells you exactly how high to pour the wine. Second, the surface area between the widest part and the narrower rim provides lots of room for swirling, which exposes the wine to air and releases all of the delicious smells that are jam-packed into wines. Finally, the narrow rim helps trap all of those smells inside the glass, allowing the wine drinker a well-rounded drinking experience. Wine glasses all have different shapes and sizes but they all have these same features meant to enhance your drinking experience. Glasses meant for red wine are wider and rounder which allows for more surface area since the aromas matter so much more with those. The fuller bodied the wine is, the fuller in shape the glass should be. White wine glasses are typically taller and narrower since that helps the wine stay chilled for longer, but you might also use a wider glass for more complex whites like our Chardonnay. Glasses meant for sparkling wines will be even taller and skinnier in order to prevent loss of the effervescence. Dessert wines are typically served in smaller glasses with very narrow rims to help concentrate aromas and to keep the alcohol from evaporating. 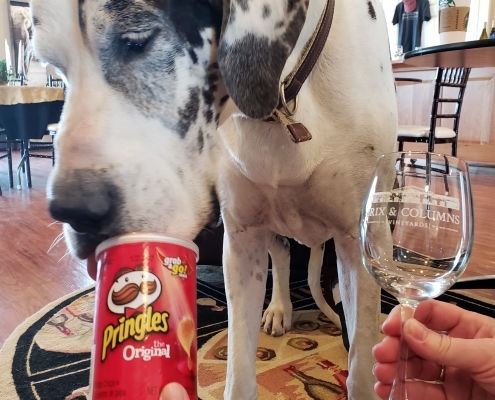 After doing this little bit of research, I guess it wouldn’t make much sense for us to switch over to Pringles cans instead of the stemmed tasting glasses we already use. 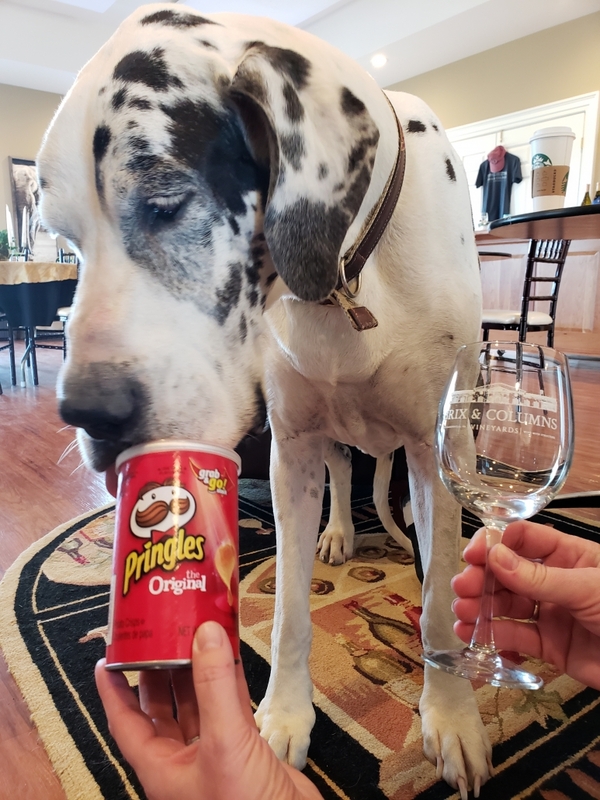 I would be lying if I said I wasn’t a little disappointed that my research didn’t go as far as getting to sniff all the different Pringles cans, but my mom was especially glad that the research didn’t go as far as taste testing the Pringles!